Freezers are wonderful things. They hold ice cream, home cooking put by for later, and frozen convenience foods. Some might say there’s no place for the latter in a the healthy, local, sustainable kitchen. Just look at the ingredients and nutrition label on a frozen lasagna…yeah, they have a point. Veggie burgers: While I’ve dabbled in homemade veggie patties and enjoyed my creations, I still like to have store-bought veggie burgers on hand. They’re one of my favorite go-to easy, fast dinners and make great hot lunches too. Recently, I’ve been buying a big package from Costco, which cuts down on excess packaging and makes the price a little more attractive. Ice cream, of course: I’m actually trying to cut down on my ice cream consumption. It got a little out of hand when we moved ashore from the boat and I was just so thrilled to have ice cream at my fingertips again! Don’t take this frozen treat for granted! Frozen spinach: This is my new favorite thing to put in smoothies. With a bag of frozen spinach in the freezer I know I can always make a green smoothie, even if I don’t have fresh greens on hand. Frozen chopped greens also make the smoothie colder and thicker than fresh greens. My favorite combo these days is frozen spinach, frozen mango, whey protein powder, and almond milk. It makes for a wonderfully thick smoothie that I like to eat with a spoon. Frozen edamame: snacking heaven. I don’t know how else you’d keep edamame around. The occasional frozen dinner…I feel kinda guilty about this one but I can’t help myself. My indulgent, lightning-fast comfort food for nights when I just don’t feel like cooking or don’t have time is frozen mac and cheese. I try to buy the natural/organic brands. It makes me feel better to know I have one of these in the freezer in case of a dinner emergency. Misc. frozen veggies: I’m a sucker for brussels sprouts and, lately, lima beans. I have a favorite tofu/lima bean spread/dip recipe that I’ll share here eventually. 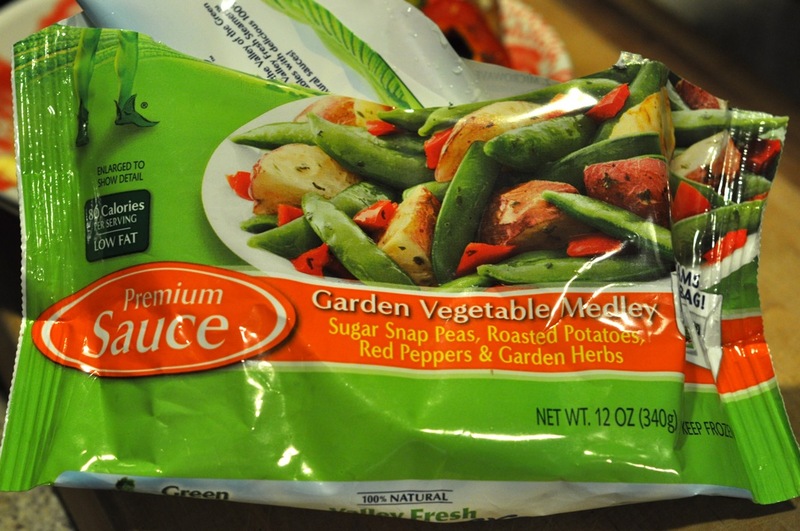 Recently, the Foodbuzz Tastemakers program sent me a coupon for a Green Giant Valley Fresh Steamers frozen vegetable + sauce dish. Normally I’d steer clear of any sauced vegetable in the frozen food aisle. I was happy to see that the ingredient lists aren’t too weird – there’s mostly just veggies in there! I was also thrilled to find macaroni and cheese with broccoli among the selection. While that doesn’t exactly qualify as enough vegetables for a meal to me, it is a great example of how to incorporate more green stuff in normally not-so-green meals (even my guilty pleasures!). The Steamer I tried tonight was good! It served Lee and I as a side dish. 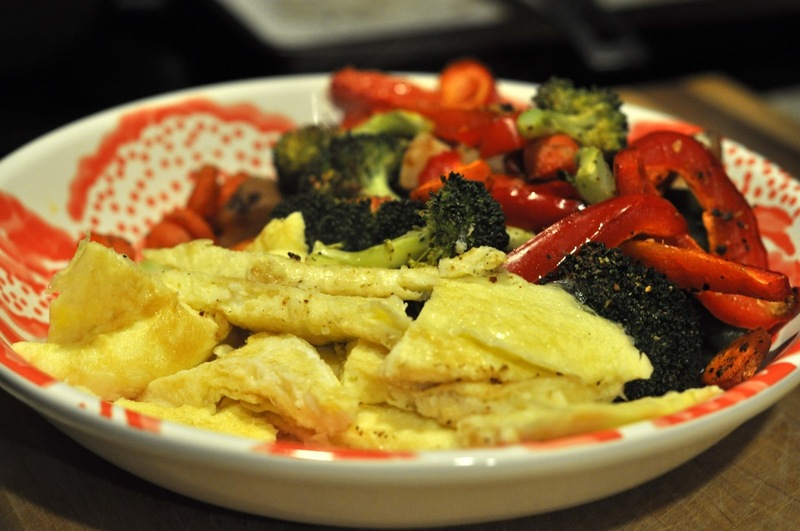 The sauce was light and with the addition of eggs tortillas, and a few more vegetables (since I cannot get enough of them) made a tasty dinner. I do wish there were more veggies in the bag. The whole thing was about as many veggies as I normally eat in one sitting. My new special celebration dinner: I just found out that I got an internship at a museum! Lee laughed when I told him what this recipe calls for. “ Three kinds of cheese and prosciutto.” I said. I should have known he’d find that funny. You see, Lee doesn’t eat cheese and I don’t eat meat. Why did I choose to make a recipe from my grandmother’s file that calls for both? 1) I wanted to make something savory rather than sweet. 3) How could I resist Alice Waters? 4) I thought I could easily adapt the recipe to our diets while remaining faithful to it’s flavors. See, I’m not so crazy. I also think I succeeded in accomplishing #4, although it took some thought. I replaced most of the cheese with chopped, roasted cauliflower, adding some veggie cheese to the filling for Lee’s calzone and goat’s milk ricotta salata to mine. The cauliflower made up the bulk of the filling and it’s earthy flavor blended beautifully with all the fresh herbs called for in the original recipe. I guess you could say I replaced the prosciutto with roasted red peppers, mostly for color. As a baker, the crust was definitely the most exciting part of this recipe for me. I resisted the temptation to mess with it, using all-purpose flour as called for rather than substituting some whole wheat pastry for some of it. The dough began with a rye flour sponge, a technique I’ve never used for pizza crust before. The dough was so, so silky and light! 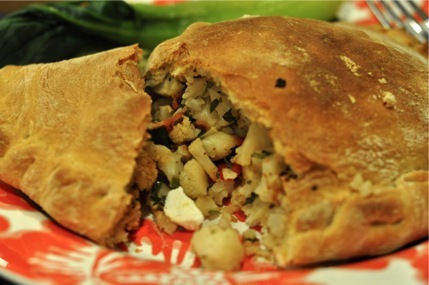 It was incredibly easy to worth with and crisped up beautifully around the calzone filling. Best of all, it did not tear on the chunk cauliflower as I feared it might. This could become my go-to pizza crust! 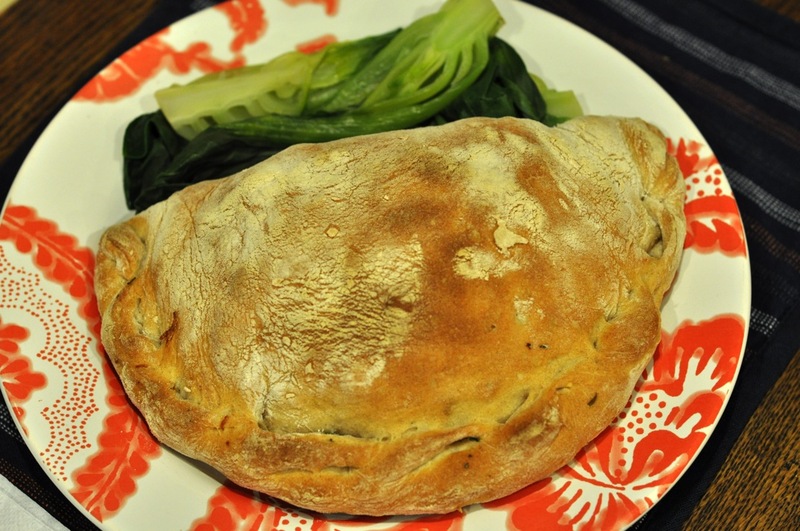 I made two calzones – or calzoni, as Water’s calls them – a slightly larger one for Lee and smaller one for myself. They were perfect for a special dinner without making us feel stuffed. I’m sure the cheese-filled originals would be outstandingly delicious and much richer. Why did my grandmother tear this recipe out of The Denver Post’s Sunday Empire magazine? My guess is that she was drawn to the novelty of calzones and the renowned Alice Waters of Chez Panisse, a restaurant she visited in Berkeley while my dad was at school there in the 70’s. Helen liked to make new and different things and these would have been right up her ally. I wonder if she ever made them, or if the clipping sat in her file all these years without her getting a taste of Chez Panisse Calzone? Blend all ingredients together in a large bowl. Make a sponge by mixing together 1/4 cup lukewarm water, yeast, and rye flour. Let it rise 20-30 minutes. With a wooden spoon, mix together 1/2 cup lukewarm water, milk, olive oil, salt, and all-purpose flour. Add to sponge. Knead dough on a floured board, adding flour to the board as needed but no more than necessary. The dough will be light and a little sticky. A soft, light dough makes a light and very crispy crust. Knead for 10-15 minutes to develop strength and elasticity. Put dough in a bowl rubbed with olive oil and oil the surface of the dough to prevent a crust from forming. Cover with a towel and put in a warm place to rise for about 1 hour, or until the dough has doubled in size. Punch the dough down and let it rise for another 40 minutes. Place a baking stone, if you have one, in your oven and preheat to 450 degrees F.
On a floured board, roll dough into 1 circle, about 14 inches in diameter, or divide into 2 or 3 circles for small calzoni. Have the filling ready, at room temperature, and work quickly putting it on half of the dough circle(s). Moisten the edges with water and fold dough over filling. Fold the dough at the end up onto itself, pinching it together. Transfer calzones to a heavily floured pizza peel, the back of a baking sheet, or a sheet or parchment paper. Slide calzones quickly into a preheated, 450 degree oven with a baking stone on a rack close to the bottom. Bake 15-18 minutes or until brown and crisp. Remove from oven, brush calzone tops with olive oil, and serve. 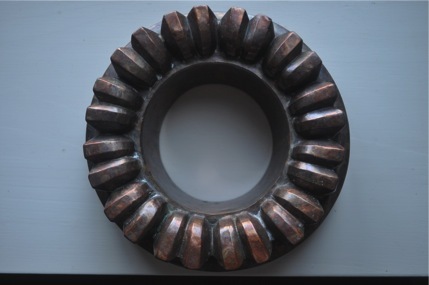 I know that lovely copper ring looks a lot like a Bundt pan but if you saw it in person, size would rule that out. I first saw this odd pan on a visit to grandmother Helen’s shortly after I moved to Denver, the city neighboring Helen’s long-time home. She was living in the local PEO house along with a handful of other elderly characters (I always joked that they should start a detective agency or something). I remember her ushering me into her minimal kitchen and pulling out this pan/mold thing in excitement. “This is an aspic mold. Do you know what aspic is?” she said. Of course I didn’t know what it was. I don’t remember how she described it but she immediately pulled a newspaper clipped out of a pile and presented me with a recipe for Tomato Aspic. We talked about tomato aspic for a while. Oh how I wish I’d had a tape recorder with me! After she died I thought about aspic a lot. It came to symbolize the last months of my relationship with me grandmother. I always thought it was odd that she’d shown me the mold and the recipe but had not given them to me. Maybe she knew they’d be mine soon anyway. Maybe it was some kind of a test to see if I could connect the two items later when they turned up among her possessions. I could have cried when I pulled the tarnished copper mold out of a cardboard box at my dad’s house earlier this summer. It was here! I hadn’t imagined the whole tomato aspic conversation! If only I could find the recipe she’d shown me…but it was there too! I recognized the yellowed newsprint as soon as I saw it. At that point I knew what Helen wanted. She wanted me to make tomato aspic, to try something new a different, and to think of her. Unfortunately, I had kind of a hard time getting my aspic out of the mold. Any advice for a molded salad newbie?..But look how red and beautiful it is! In a small bowl, sprinkle gelatin over chicken broth and soften for 10 minutes. Combine tomato juice, celery, scallions, Worcestershire sauce, celery seed, salt, sugar, and white pepper in a saucepan. Set saucepan in cold water and stir until mixture is cool (I put a few inches of water in the sink). 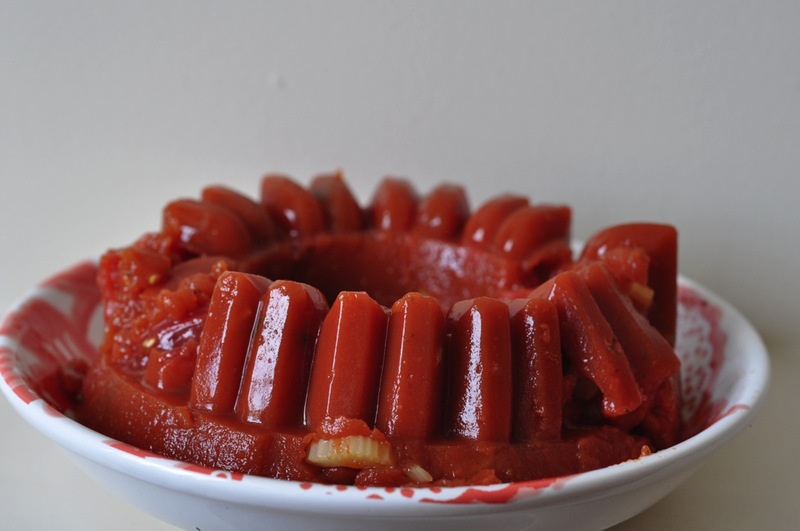 Rinse a decorative 2 qt ring mold with cold water, pour in tomato mixture. Chill in the fridge for at least 4 hours or overnight. Unmold and serve on lettuce leaves with the following dressing. Blend all ingredients well ad let stand for an hour to develop flavors. What did Lee and I think of the aspic? Well, it was different that’s for sure. My mold was too small for the whole recipe so poured the rest into two small bowls and we ate that with grilled cheese sandwiches for dinner (it was like tomato soup and grilled cheese!). I served the aspic over a green salad with ranch dressing and it was a great combination of flavors and textures. The aspic was much more intensely tomato-y than I expected it to be. It was a little too intense for Lee. He made me promise only to serve tomato aspic in very small quantities in the future. I will be making this again. Maybe for a potluck because it’s just so strange and retro. 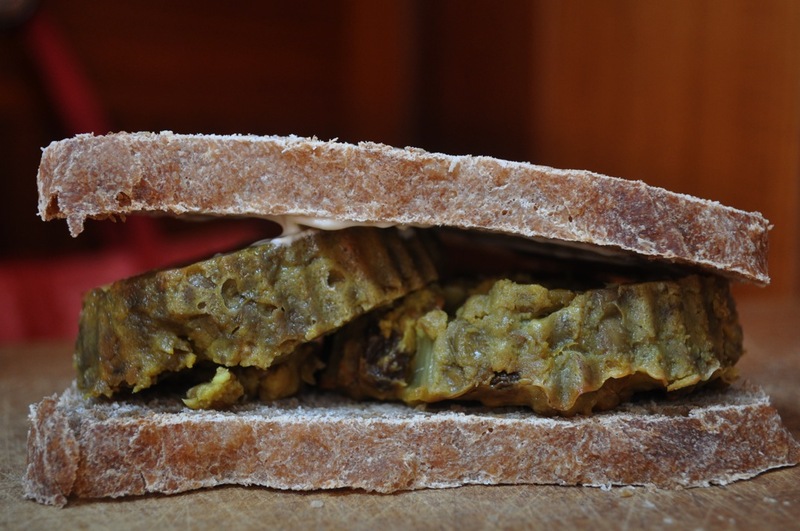 Split in half on homemade bread – leftover lentil loaf sandwich. Laziness is the mother of invention. Last night I was a little slow to start fixing dinner. I wasn’t sure if we were having a potluck with our sailing buddies or not so I planned a dish that I felt good about serving to other people. Most things I make don’t fall into that category. I started cooking the lentils for a loaf I’d fixed and enjoyed a couple of times in the past. When we learned that a potluck was not on the agenda that night, Lee and I went for a swim and came back to a pot of cooked lentils. At that point, I was feeling very lazy about making the full-fledged lentil loaf. It was supposed to take at least 45 minutes to cook and I was hungry. Since I no longer had to worry about making my dinner presentable to others, I decided to have some fun. What are muffin cups for but to cut down on cooking time and make a meal fun? The first step was to spice up the recipe a bit. The previous times I had made this loaf, I was disappointed with the flavor and knew it wasn’t living up it it’s potential. The recipe already included raisins and nuts so curry powder seemed like the perfect spice to add. The spice combination I came up with is by no means traditional curry flavoring. I just pulled jars off the spice rack, adding what I liked and what I thought might taste good. Really, the spices and their amounts are up to your individual taste. I do, however, highly recommend the raisins and nuts. They may seem like strange ingredients to some but they add the perfect crunch and sweetness to the lentils. Unfortunately, I didn’t have any cashews on hand. I considered trying macadamia nuts, the only plain nuts I have right now, but decided to hoard my minimal supply instead. Lee downed three “Texas-sized” muffin loaves and I was satisfied with two. That left one to experiment with as leftovers (and a chance for me to take a picture during the daytime). The loaves were delicious and very filling with a side of random sauteed veggies. Lee and I split a baked plantain for dessert, my first foray into plantains. I’m definitely going to get more of this Caribbean staple at the market today! It might become a favorite dessert and I’m eager to try other plantain preparations. Combine lentils and water in a medium saucepan and bring to a boil; reduce to simmer and cook for about 1 hour, or until the lentils are cooked and the mixture is thick. Saute garlic and onion in a skillet until the onion is translucent. Add the onion mixture, spices, raisins, nuts (if using), flour, and eggs to the saucepan of lentils or combine all the ingredients in a large bowl if the saucepan is not big enough. Mix thoroughly and pour into 6 lightly oiled jumbo muffin cups. You can also make one large loaf or 12 regular-sized muffins, just adjust the baking time accordingly. Place muffin cups on a cookie sheet if using silicon cups and bake in 350 degree oven for 35-45 minutes (on the longer end of this range for larger cups and 45+ minutes for a loaf). Remove from oven and allow to cool. Gently remove muffins from tin or individual cups and serve with chutney or any sauce that suites your fancy.